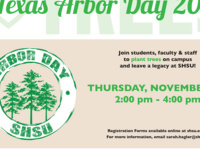 Students, faculty, and staff are invited to join Landscape Services and Leadership Initiatives for tree-planting events held in honor of both Texas and Sam Houston Arbor Day. Trees will be planted on the SHSU campus, and participants will be able to help leave their legacy behind through the act of planting trees that will continue to grow and thrive for years to come. Contact the Department of Leadership Initiatives about registration today!